Architect Frank Lloyd Wright was born in Wisconsin and designed many houses in the Upper Midwest. There are some notable houses and buildings designed by Frank Lloyd Wright in Minneapolis and around Minnesota. 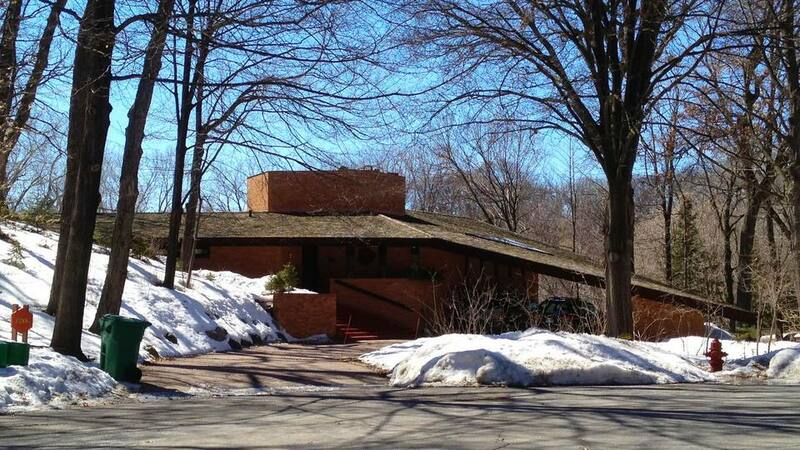 Here's a list of Frank Lloyd Wright houses and buildings in Minneapolis and the Twin Cities. The Malcolm Willey House was built in 1938 in Prospect Park, Minneapolis. It is a modest, single family home and is regarded by some as the prototype for Wright's notable Usonian style houses. The house originally had a view of the Mississippi River which was unfortunately blocked by the construction of the I-94 freeway in the 1960s. The Willey House is listed on the National Register of Historic Places. The house is privately owned. It was recently restored and is occupied by its current owners. It is possible to tour the Malcolm Willey house, the owners hold occasional open-house events, and you'll need to contact them via their website to receive notification of the next open-house event. The Neils House is in west Minneapolis, overlooking Cedar Lake. This home is notable for the use of marble and stone walls, and aluminum window framing, unusual for a Wright house. The house was built in 1950, in the Usonian style. It is listed on the National Register of Historic Places. The Neils House is privately owned and occupied by members of the Neils family. The house is not open for tours. The Paul Olfelt House is a family home and was built from 1959 to 1960. The exterior of the house, which can be seen from the street, has a dramatic sweeping car port. The house is privately owned and not open for tours. The Fasbender Clinic was constructed from 1957 to 1959 and used as a medical clinic until 1966. It is located at the junction of Highway 55 and Pine Street in Hastings and was added to the National Register of Historic Places to save it from being destroyed by construction of Highway 55. The building was built using interesting and complicated polygonal shapes, and the style is that of Wright's "inward house" period. The roof is clad in copper and extends almost to the ground. The Fasbender Clinic building changed hands several times, is owned by Edward Jones Investments and used as an investment and financial services office. This home was built in 1957. It's a two-bedroom home with a separate cottage that sits on 20 acres of lakefront property. In 2010, the home, cottage, and land were listed on the market for $2.4 million. The house is privately owned, and not open to the public. Francis Little commissioned a summer home at Deephaven, overlooking Lake Minnetonka, in 1908. The house was not built until 1914, but the large home was one of Frank Lloyd Wright's great prairie-style residences. The family of the original owner lived in the home for many years, but in the face of rising property taxes, tried to sell the large house in 1972. No local buyer wanted to purchase it, but a group of Frank Lloyd Wright enthusiasts contacted the Metropolitan Museum of Art in New York, who agreed to buy the house. Much of the Little House was dismantled, shipped, and reinstalled at the Metropolitan in New York. The library of the Little House is in the Allentown Art Museum in Pennsylvania. Some of the house remains in Minnesota; the Minneapolis Institute of Arts purchased the house's hallways and installed it in one of their galleries.